Hello and thanks so much for joining me for the final day the Newton’s Nook Designs January release! 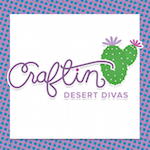 All the new January products will be available for purchase on Friday, January 18th at Newton’s Nook Designs online store and other craft retailers! 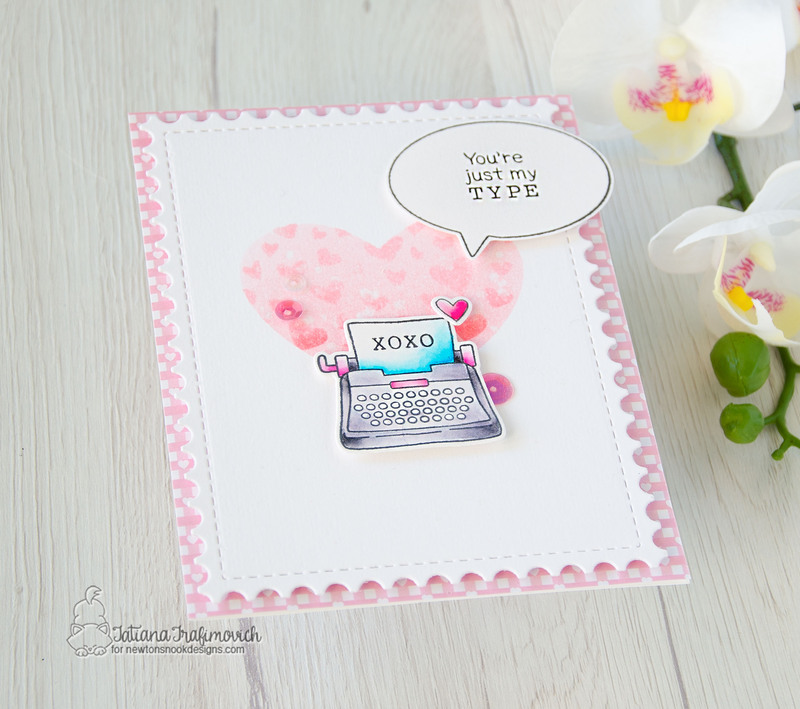 Today we have two small, but not less adorable stamp sets called My Type and Candy Heart. Both new sets come with the coordinating dies. Giveaway alert!! NND is giving both stamp sets away to a lucky winner so make sure you read all the way to the bottom of this post to see how to win! 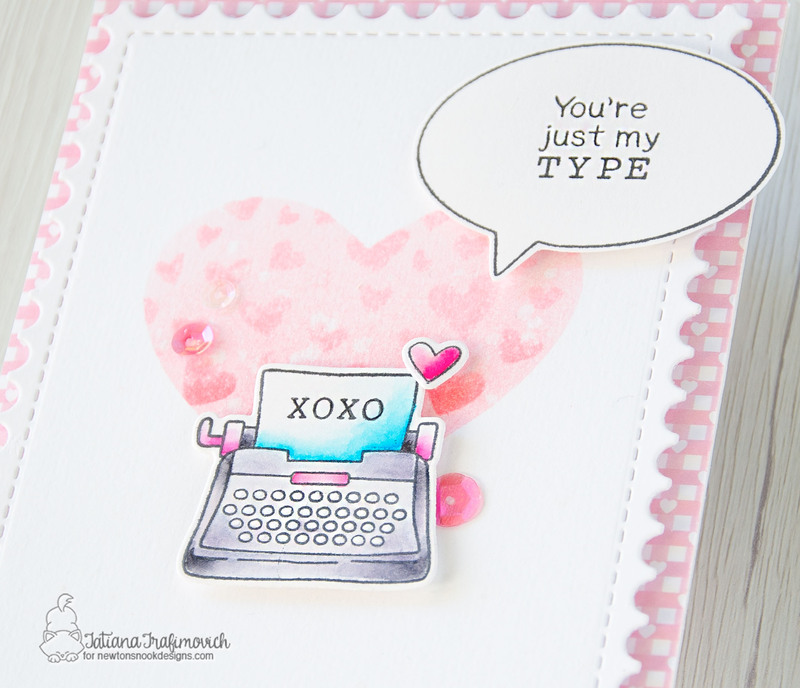 My first card features My Type stamp and die sets! To start, I die cut the typewriter from Strathmore Bristol paper using My Type Die Set and stamped the coordinating image from My Type stamp set with VersaFine Onyx Black ink since it doesn’t smudge when used with water. Next I did a super simple coloring using Tombow markers: n.N25, n.N60, n.452, n.703, n.772. I prepared the sentiment element using the same My Type set and a speech bubble from Newton’s Day Dream stamp set. For the background I die cut a stamp edge frame from Framework Die Set on a piece of a white cardstock and a big heat from Darling Hearts Die Set on a masking paper. Next I applied the negative part of the heart mask towards the center of my card and inked it with a light pink ink. Before removing the mask, I tape on top Tumbling Hearts stencil and inked the heart window once more creating a pattern on top. Finally I could reveal the mask and pop all the elements on a foam tape for a bit of dimension. 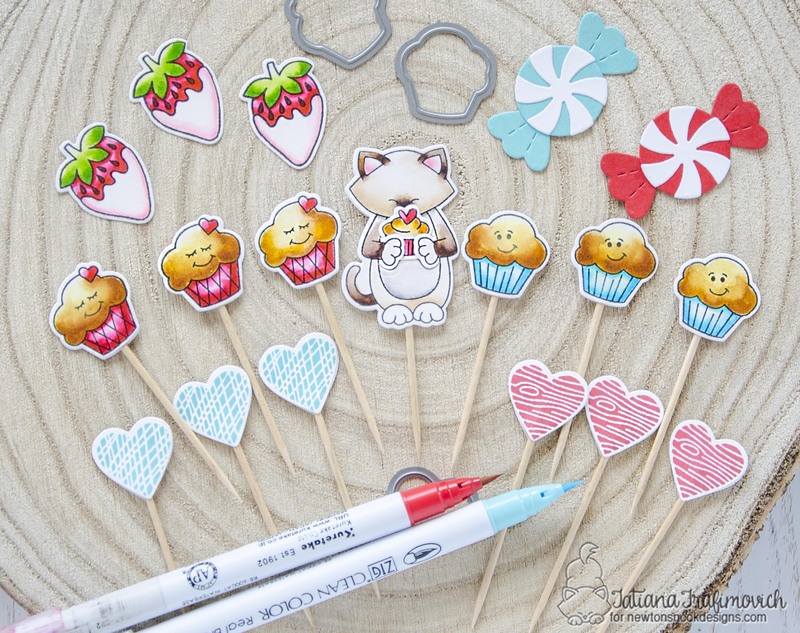 Creating my second card, I decided to stretch more Candy Heart stamp and die sets and created entire project using only this small bundle. 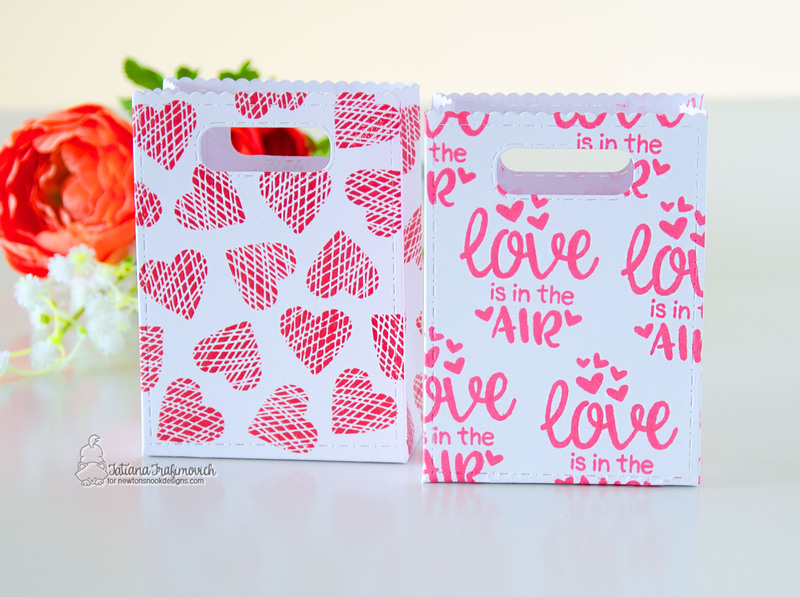 Candy Heart Die Set is done in a very clever way and has the shaped heart matching the heart stamp from Candy Heart stamp set plus another simple heart die. I used the second one and repeatedly die cut it on a piece of Tim Holtz watercolor cardstock that was previously inked with Spun Sugar and Picked Raspberry Distress inks. Next I trimmed and scored in half a regular A2 size card base from a bright pink card stock. I placed the negative part of the die cut panel to the card base and marked all the heart windows with a pencil. 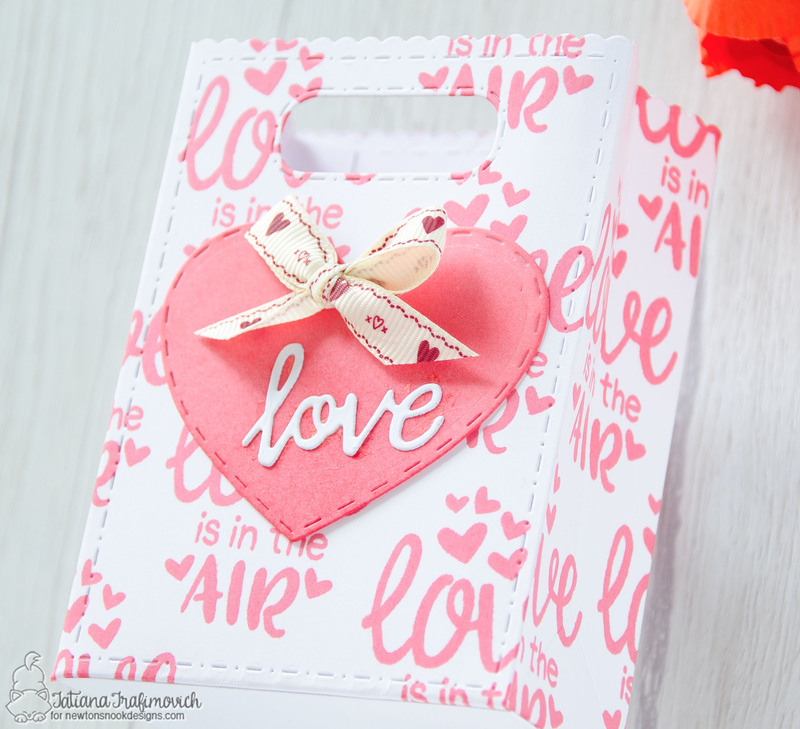 Finally I heat embossed different sentiments from Candy Heart stamp set with a white embossing paste directly on the card front, erased all the pencil lines and popped the die cut panel on top. A few matching sequins finished this card. 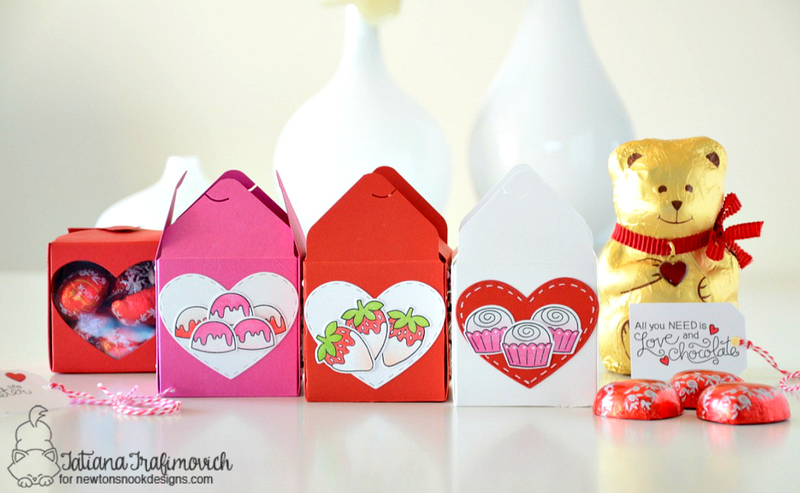 Would you like to win both the “My Type” and “Candy Heart” Stamp Sets? We will choose ONE lucky winner two win both of these mini stamp sets! Comment on the NND blog and Design Team blogs (see list below)! Thewinner will be chosen at random from the collective reveal posts. Make sure to check out each of their blogs and comment for your chance to win. You will not know which blog has been chosen so the more you comment on the better your chances are of winning! You have until Thursday January 17th at 9pm EST to comment — winners will be announced on the blog post on Friday, January 18th. 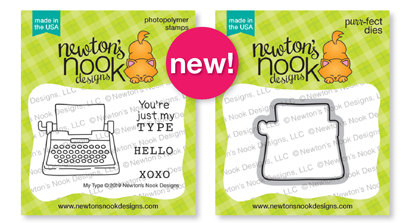 Hello and welcome to Day 3 of the Newton’s Nook Designs January release! Thanks so much for joining me today! 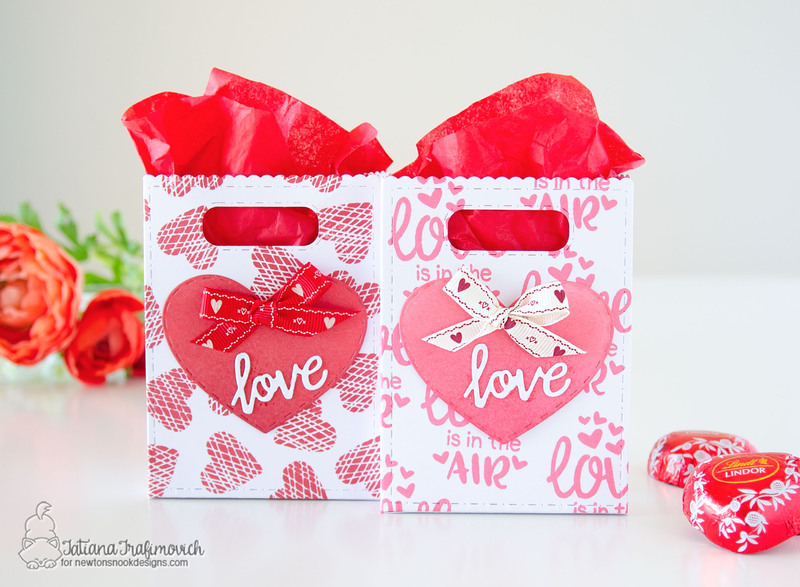 There would be no perfect January release without Valentine’s Day theme! Right?! 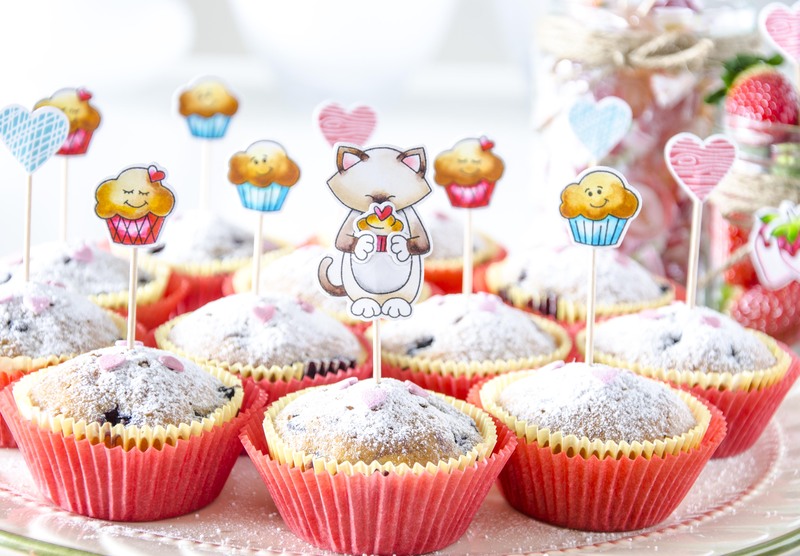 That’s why I’m super excited to share with you the adorable owls from Love Owl-ways stamp set! In case you’re interested, this set comes with the coordinating dies! Giveaway alert!! 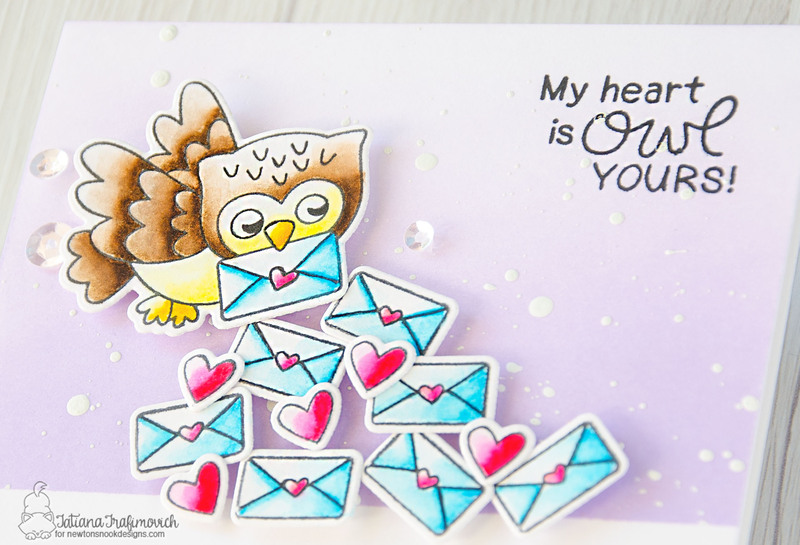 NND is giving a new Love Owl-ways stamp sets away a lucky winner so make sure you read all the way to the bottom of this post to see how to win! 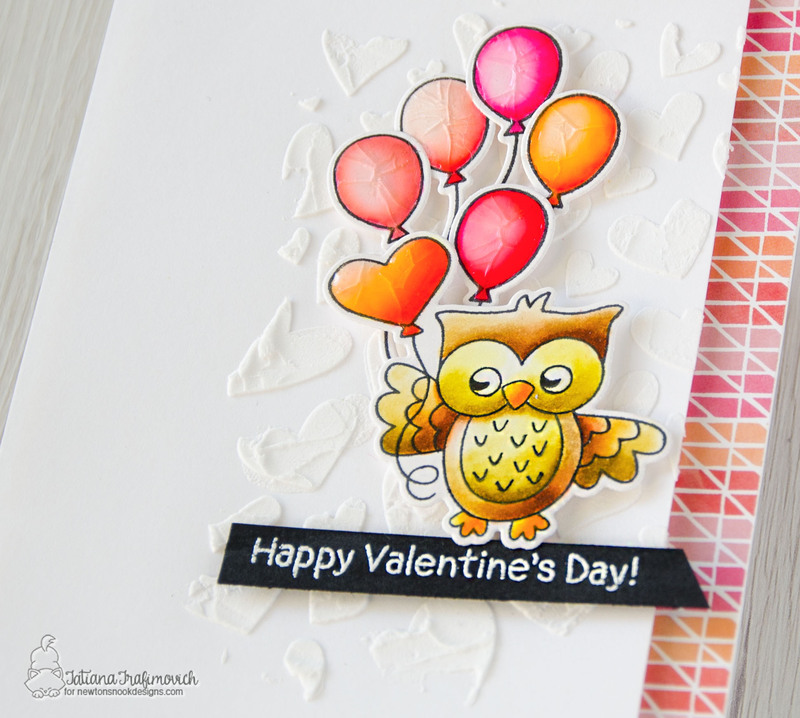 And here’s my first project featuring the cutie owl from Love Owl-ways stamp set with the balloons! You know that I’m a great fan of the balloons for all the occasions!!! Since my choice in terms of color media was on watercolor markers, I went for my favorite Strathmore Bristol paper, VersaFine Onyx black ink for stamping since it’s waterproof and a small water brush from Pentel. I first made die cutting using Love Owl-ways and Playful Pandas Die Sets and then stamped the coordinating images from Love Owl-ways and Playful Pandas stamp sets. As always I’m leaving you the colors I used on this project: TOMBOW n.026, n.703, n.723, n.761, n.815, n.835, n.873, n.905, n.977. Assembling all the elements, I give a little bit of texture to the card base, embossing a white embossing paste on top through Tumbling Hearts stencil. Next I popped the colored stamps on a foam tape and have a little happy accident on adding a shiny coat of Nuvo Crystal Clear Drops that cracked, but gave me a super fun texture! I really like how it turned out and wonder if any of you had the same experience with Nuvo Drops? Finally, a heat embossed sentiment from the same Love Owl-ways stamp set on a piece of a black cardstock finished this project. I just cannot stop playing more with the beautiful owls and here’s my second project! I started with the same materials that I used on a previous card except of Sending Hugs stamp and die sets used to create a bunch of envelopes. I’m leaving you all the exact number of watercolor markers used here as well: TOMBOW n.025, n.090, n.703, n.723, n.761, n.815, n.835, n.873, n.905, n.969. I decided to keep everything clean and simple. A regular A2 size card base was masked and inked with a light lilac ink. Next I added a sentiment towards the top right corner by simply stamping it from the same Love Owl-ways stamp set with the same VersaFine Onyx Black ink I used for the images for a perfect match. Finally I popped all the watercolored elements on a foam tape for a fun dimensional look and finished with a few crystal clear sequins. 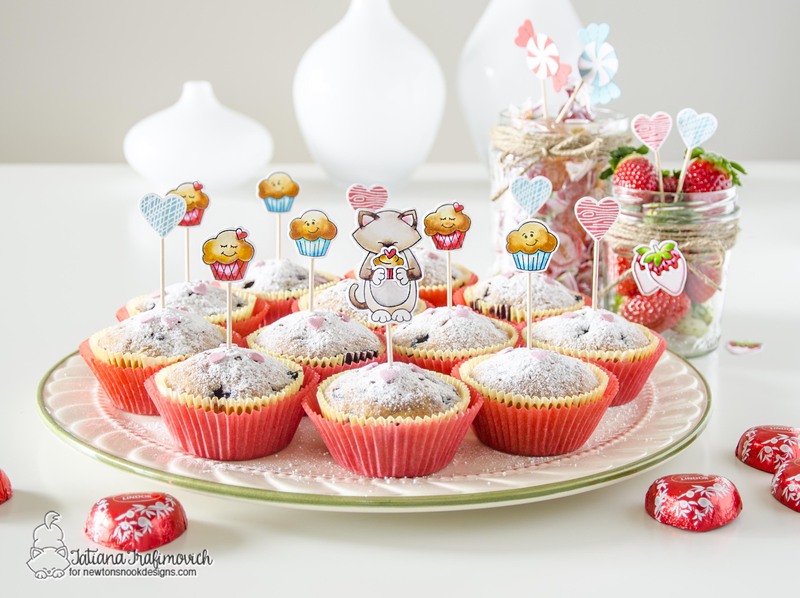 Would you like to win the “Love Owl-ways” Stamp Set? 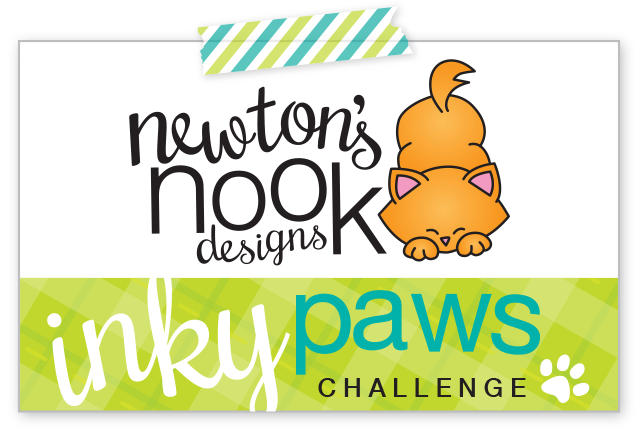 Hello and welcome to Day 4 of the Newton’s Nook Designs January Release! 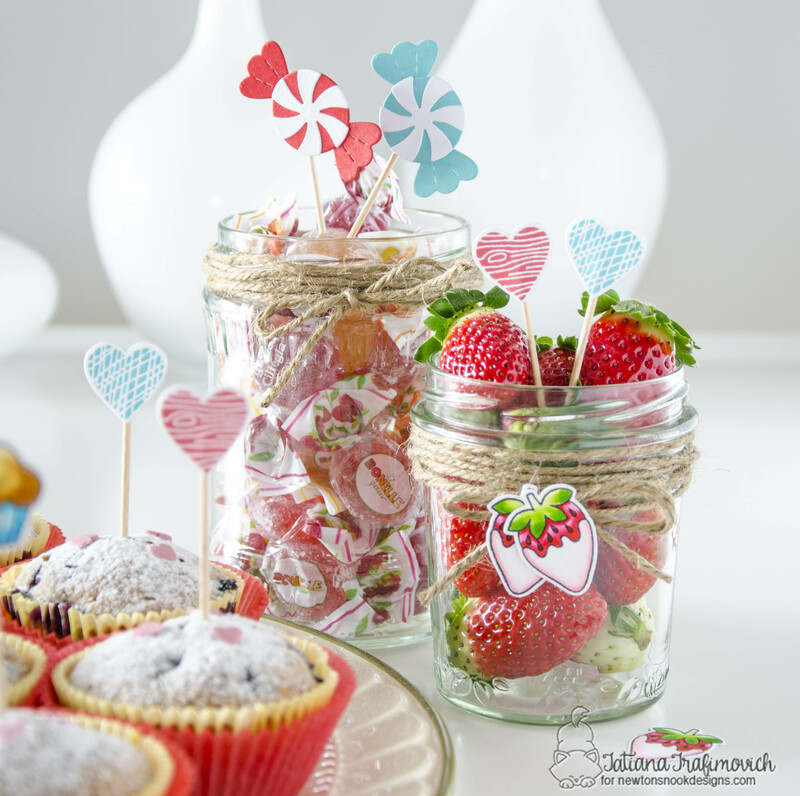 The last day reserves us a very sweet surprise!!! 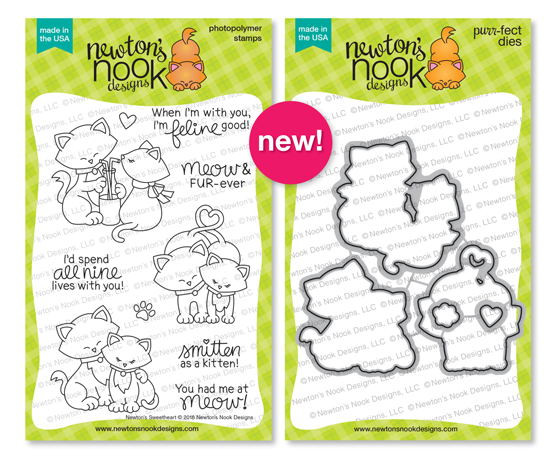 A new super adorable and absolutely charming stamp set featuring the cutest mischief Newton!!! All the new January products will be available for purchase on Friday, January 19th at Newton’s Nook Designs online store and other craft retailers! 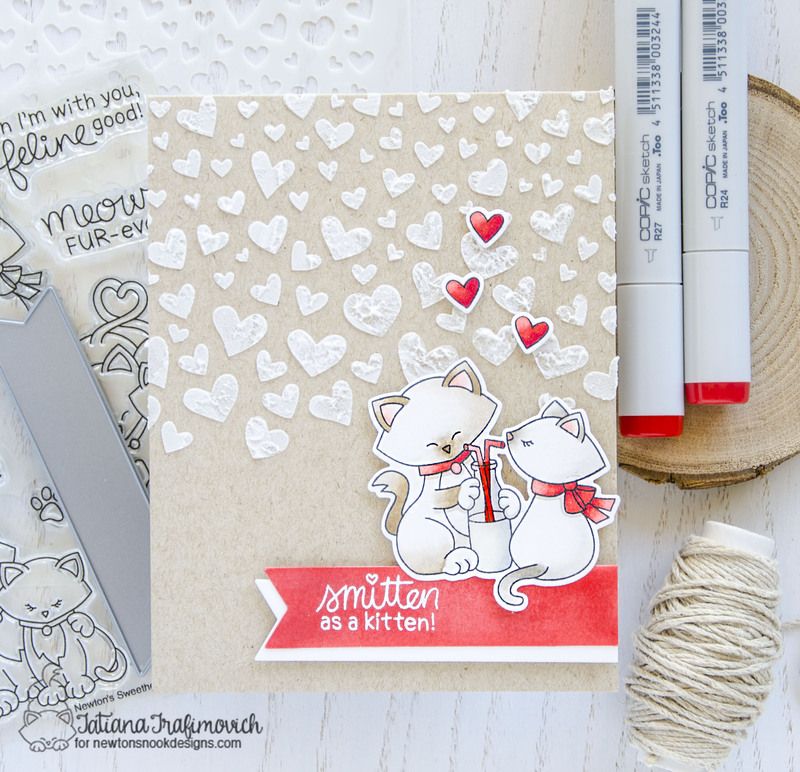 Today all the Design Team is focusing on a very special stamp set called Newton’s Sweetheart and there’s no need to tell you that it has stolen my heart at the first sight! LOL!!! All the die fans can get the coordinating dies as well. Giveaway alert!! 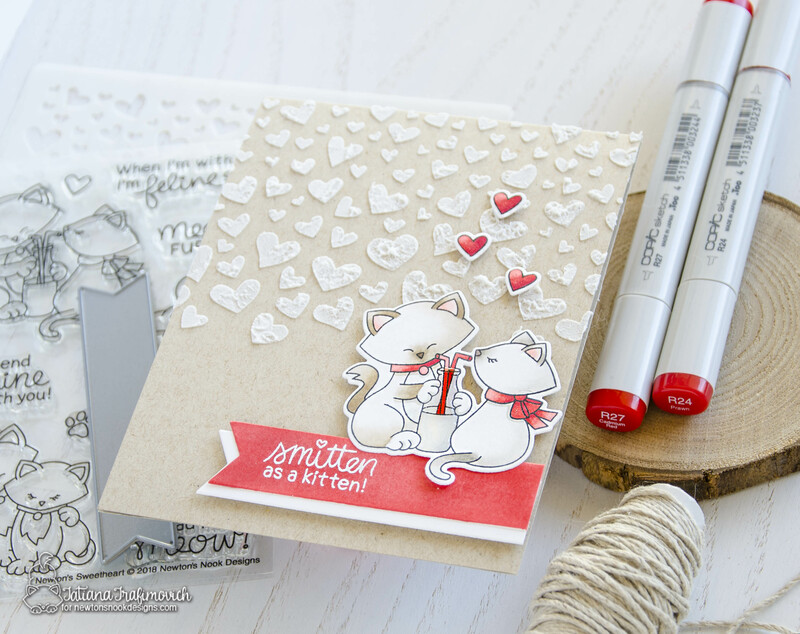 NND is giving new Newton’s Sweetheart stamp set away to one lucky winner so make sure you read all the way to the bottom of this post to see how to win! I love the look of white on a kraft cardstock. And so I started this card applying a white embossing paste through just released Tumbling Hearts Stencil. I purposely didn’t smooth the embossing paste to achieve a fun texture. 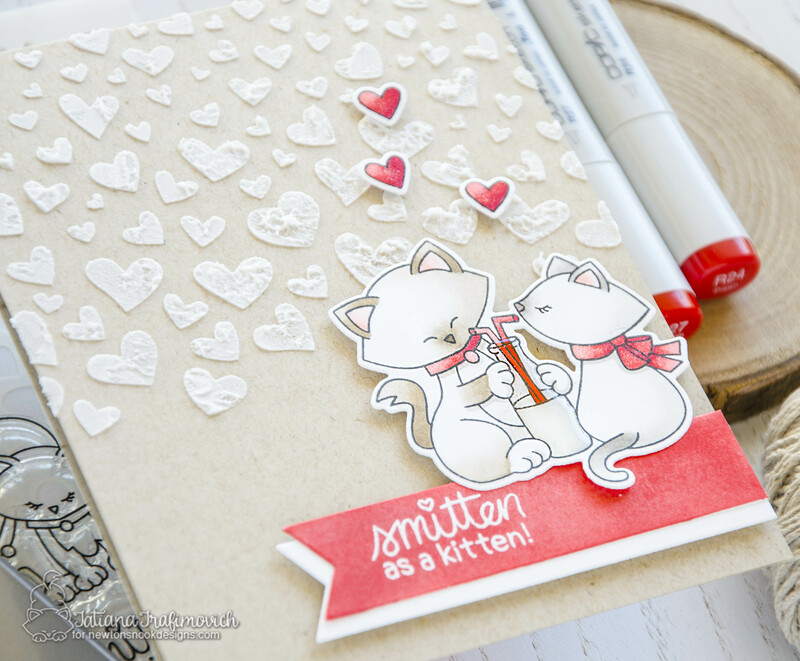 While the embossing paste was drying, I die-cut, stamped and colored with copic markers a sweet couple of kitties along with a few tiny hearts. I kept my hand very light and chose soft colors for the critters almost giving them a white slightly shaded look. Then I added bright red details to make them pop against the background. Finally, I prepared two fish-tale banners die-cutting them with Frames & Flags Die Set from a white cardstock first and then coloring one with the same res shades I used previously on the kitties. The last steps were a heat embossed sentiment from the same Newton’s Sweetheart set, a shimmer pen and a coat of Glossy Accents from Ranger on the milk bottle. 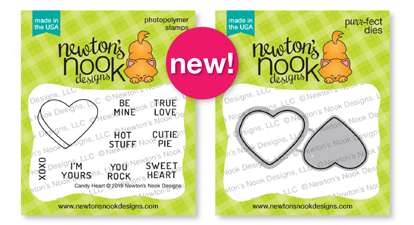 Would you like to win the “Newton’s Sweetheart” Stamp Set?